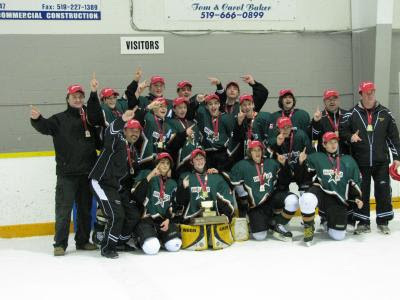 Congratulations go out to the RE/Max Wayne Shields Bantam A/E team for winning the OMHA Championship. Way to go boys! Frank Santini, Head Coach is proud of his team's accomplishments. This Bantam AE Team looks up to this top coach, who is known for 'being there' for his players. We are very proud of the Lions Club of Wasaga Beach Novice Rep team for being OMHA Finalists in the Novice B-CC East Division. Great season kids!